Just as colourful as the country it represents is the logo “visit Mexico“, which from now on will again travel with the Sauber F1 Team around the world. The North American country is promoting itself with the individually coloured letters during 12 of the remaining 18 Grands Prix in the prominent position on the back of the rear wings of the two Sauber C31-Ferraris. 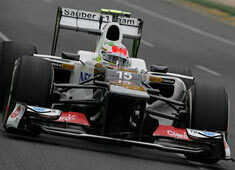 At all championship rounds the nation’s name will be present on the cars’ nose cones, on the racing overalls and helmets of drivers Sergio Pérez and Kamui Kobayashi, as well as on the team’s equipment.